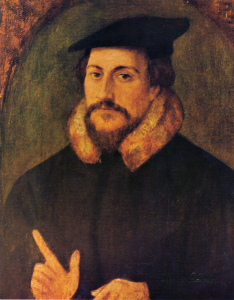 There is a growing recognition by the media and by scholars that Calvinism is growing in China these days.1 The news has gained the attention of a number of Americans, particularly since the 16th century Reformer John Calvin is likewise having a comeback in the US in the so-called ‘New Calvinism‘ movement.2 At least one scholar has called the movement in China ‘Chinese New Calvinism’.3 Unfortunately, I think this view is problematic. There is no historical link between American New Calvinists (e.g., John Piper, Mark Driscoll, Albert Mohler, etc.) and Calvinists in China. Moreover, the many ‘foreign’ voices who have helped bring Calvinism to China (e.g., Jonathan Chao 赵天恩, Stephen Tong 唐崇荣, Samuel Ling 林慈信, etc.) are, without a better term, ‘Old Calvinists’ with close ties with institutions like Westminster Seminary. In Western contexts, ‘Calvinism’ and ‘New Calvinism’ is almost always a shorthand for TULIP – that is, it revolves around topics like salvation and predestination. This is one of the major criticisms of Westminster Seminar of California professors like R. Scott Clark and Michael Horton of the New Calvinism movement. However, in China, Calvinism is much more interested in ecclesiology – the theology of the church. The reason why an ecclesiology is so important to these Chinese Christians is it gives them a way of engaging the state and the society. That is, a strong understanding of the church gives a strong understanding of an institution that can relate to the government (and argue for religious freedom) and the society (and exercise social concern). Though it is not a major aspect of New Calvinism, the theology of the church is a very important part of John Calvin’s own thinking, making up the fourth and last book of the Institutes of the Christian Religion. This third point explains why the Chinese interest in Calvinism, particularly by intellectuals,5 is so fascinating. A number of Chinese churches have gotten into a lot of trouble because of it,6 but will Calvinism be a strong enough force to change the Chinese government policies and practices? This entry was tagged Calvinism, China, Chinese Christianity, Ecclesiology by Alexander Chow. Bookmark the permalink. Alexander Chow is an American-born Chinese who was raised in Southern California. He completed his PhD in theology at the University of Birmingham, followed by a postdoctoral fellowship at Renmin University of China, where he was doing research in Chinese Christianity and teaching in the School of Liberal Arts, and joined the University of Edinburgh in September 2013. He is also an editor of Studies in World Christianity. The differing cultural engagement and the implications it takes fascinates me. I am not Calvinist so I have to admit I find it difficult to grasp how calvinism would shape the Churches response to the government and social situation differently to say Classical Arminianism unless it is to create a more ‘divine fatalistic’ approach. From a soteriology point of view, how does Chinese Calvinism differ from the New Calvinism and in what way does it shape a distinct Chinese reformed Ecclesiology? These are excellent questions — but really too big for me to answer in the comment of a blog post. Part of this has to do with the variety of expressions of Chinese Calvinism. For the groups I was speaking of, the importance of ecclesiology is mainly in explaining how the church is to engage both the society and the state (the subject of 1/4 of Calvin’s Institutes). Many of these churches will have elders, with some having a more presbyterian-type of polity while others having a more congregational-type of polity. For your questions about soteriology and Arminianism, some churches have had debates about ‘hyper-Calvinism’ and pre-/post-lapsarianism. But, as I suggest in my article, I am not entirely sure the belief of a divine monergism is very strong or can be very strong within the Chinese cultural context. It’s frustrating that you published at the same time, so presumably there will be no interaction. Alex: I used to work with the Christian Reformed Mission in Taiwan, and later was US Vice Consul in Guangzhou. Chinese is my second language, with decent reading skills and poor writing skills as well as spoken. Being a Christian as well and long interested in China’s Christian history, I found your post very interesting and hope to see a lot more. Thanks. Thanks, Peter, for the encouragement. I’m glad you enjoyed the read.